Tropical cyclones in the western North Atlantic basin are a persistent threat to human interests along the east coast of North America. Occurring mainly during the late summer and early autumn, these storms often cause strong winds and extreme rainfall and can have a large impact on the weather of eastern Canada. 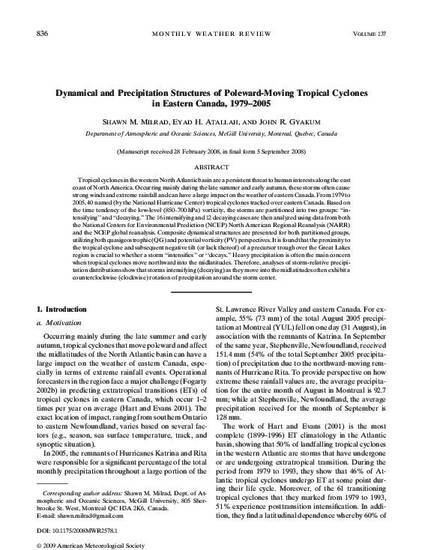 From 1979 to 2005, 40 named (by the National Hurricane Center) tropical cyclones tracked over eastern Canada. Based on the time tendency of the low-level (850–700 hPa) vorticity, the storms are partitioned into two groups: ‘‘intensifying’’ and ‘‘decaying.’’ The 16 intensifying and 12 decaying cases are then analyzed using data from both the National Centers for Environmental Prediction (NCEP) North American Regional Reanalysis (NARR) and the NCEP global reanalysis. Composite dynamical structures are presented for both partitioned groups, utilizing both quasigeostrophic (QG) and potential vorticity (PV) perspectives. It is found that the proximity to the tropical cyclone and subsequent negative tilt (or lack thereof) of a precursor trough over the Great Lakes region is crucial to whether a storm ‘‘intensifies’’ or ‘‘decays.’’ Heavy precipitation is often the main concern when tropical cyclones move northward into the midlatitudes. Therefore, analyses of storm-relative precipitation distributions show that storms intensifying (decaying) as they move into the midlatitudes often exhibit a counterclockwise (clockwise) rotation of precipitation around the storm center.